Our go-to Gluten-Free Cream Cheese Fruit Tart with Almond Crust is a gorgeous dessert sure to impress at any occasion. You’ll love how easy it is to make for slice and serve or as individual mini tarts. 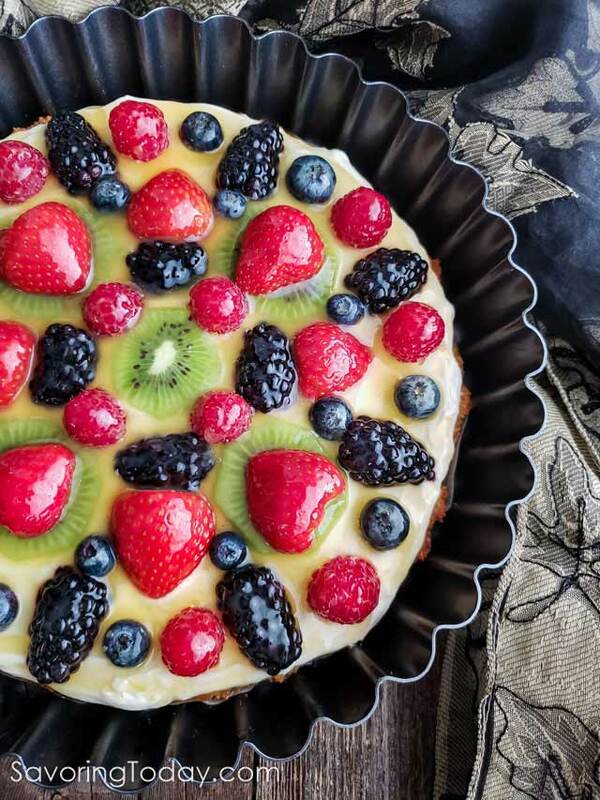 Everyone loves this Cream Cheese Fruit Tart Recipe! It’s beautiful and delicious! A fruit tart with luscious cream cheese filling, topped with a tangy citrus glaze is always a brunch favorite because it satisfies without being overly sweet. This means the juicy goodness of the fruit shines through and you won’t regret eating it before lunch. Trying to come up with a truly delicious gluten-free dessert can be challenging when so many gluten-free crusts fall short of amazing. Among gluten-free flours, I find almond flour produces superior results without any of the grittiness common with rice flours. This gluten-free tart crust is tender and light, unlike more dense pastry or shortbread type crusts, which makes it easier to eat when you’re balancing a plate on your lap at a party. 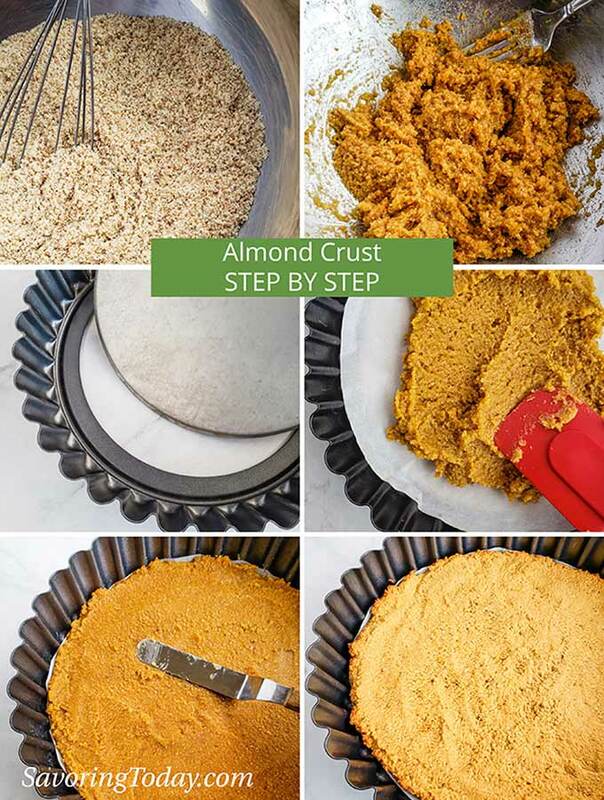 Step by step for making gluten-free tart crust with almond flour. Start with a single fruit to anchor the design, in this case, blackberries. Work from the outside in, add a single berry to divide the circle into quarters. Add the next selection of fruit (raspberries) right beside the blackberries, working around the outer rim. Begin the second ring just inside by placing the kiwi as to divide the inner circle into quarters like step 2. Continue to fill in the space to create your preferred design. Remember, it’s okay to leave some white space. The size of the rings will depend on the size and shape of the fruit. Starting on the outer edge and dividing into quarters makes it easier to arrange the fruit evenly. will make it easier to cut and serve clean slices instead of trying to slip a server down under the edge of a pie plate. Use a sharp knife to cut a wedge in the tart and slide a pie server under the slices and slide straight out. Wipe the knife blade clean after each cut to avoid smearing cream cheese on the fruit of the next slice. Divide crust into 10 to 12 (3-4 inch) mini tart cups. Place tart cups on a rimmed baking sheet and bake crust for about 10 minutes. Divide filling evenly between the number of tart cups by spreading or piping into each cup. Arrange fruit on top of filling, as desired, in a single layer. Brush glaze over fruit, or leave unglazed if serving within a few hours. are ideal for self-serve at parties. TIP: Cupcake liners in a muffin pan can work to make mini tarts in a pinch, though are a little less sturdy. See the photo example. All the components can be made in advance and stored separately until ready to assemble. Berries will last the longest and maintain the best texture up to 3 days. Cut ripe peaches, plums, pears, and nectarines will weep more and should be served within 24-36 hours for best results. 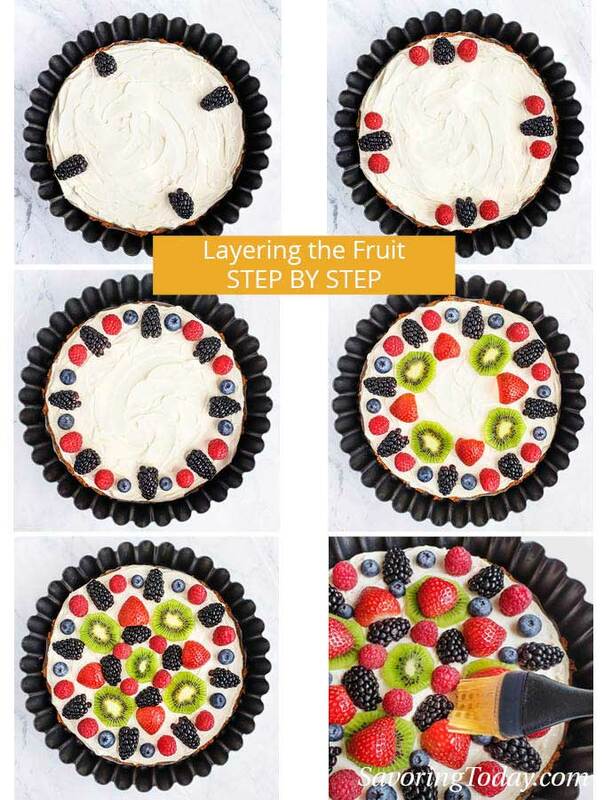 Apply the fruit tart glaze with a soft pastry brush to evenly coat and keep the fruit from browning or drying out. To make it Paleo and Dairy Free, substitute homemade coconut cream cheese, homemade cashew cream cheese, or other favorite dairy-free substitute for the cream cheese in the filling. Sub ghee or coconut oil for the butter. Any combination of vibrant berries, mandarin oranges, peaches, plums, pear, mango, pineapple, nectarines, or kiwi will create your most inspired fruit arrangement. Use any favorite pastry crust—pie crust or shortbread crust works well too. Skip a step and leave it unglazed if serving right away. Photo example below. 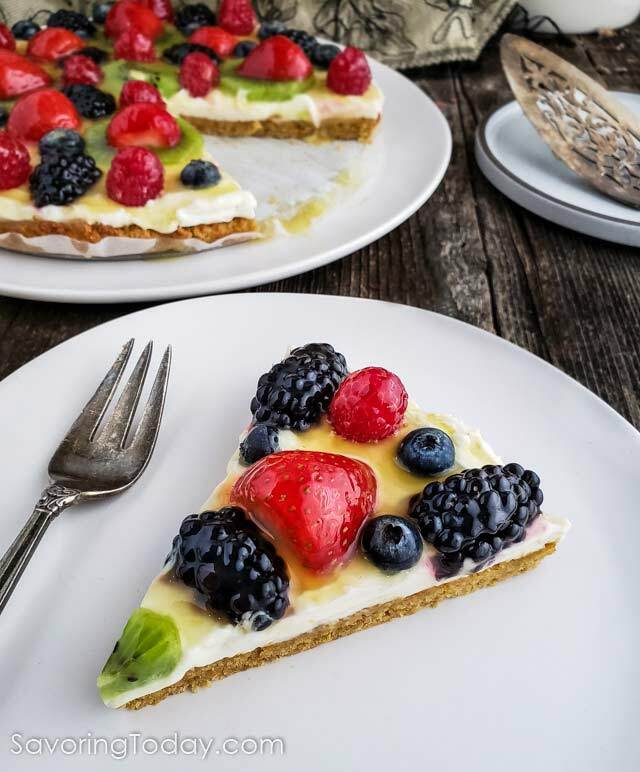 Cream Cheese Fruit Tart without citrus glaze. Luscious cream cheese filling spread over an almond crust, topped with fresh fruit and a tangy citrus glaze. Heat oven to 350°F. Grease the bottom of 8-inch tart pan or line with parchment paper. Mix 1 cup almond flour and 1/8 teaspoon salt in a mixing bowl to incorporate salt and break up any lumps in the flour (if using coconut palm sugar, add that into the dry ingredients here). In another bowl, blend 1 egg, 1 tablespoon butter, 3 tablespoons honey, and 1/4 teaspoon almond extract. Add wet ingredients to dry ingredients and mix until well blended. Spread in a tart pan and smooth with spatula to form an even crust. Bake in the oven for 10-12 minutes or until light golden brown at the edges and in spots. Remove from oven and cool completely on a wire rack before adding filling. Mix 1/2 cup orange juice, 2 tablespoons honey, and 2 teaspoons tapioca starch in a small saucepan over medium heat, stirring to combine. When mixture begins to boil, reduce heat to medium-low and simmer, stirring constantly, until glaze thickens--2-3 minutes. Transfer glaze to a bowl and allow to cool completely before glazing the tart. Using a mixer, beat 8 ounces cream cheese until smooth. Add 3 tablespoons honey, 1 tablespoon lemon juice, 1 teaspoon zest, and 1/2 teaspoon vanilla to the cream cheese and mix until well blended. Set filling aside until crust and glaze are completely cooled. These steps can all be done in advance and reserved until tart is ready to assemble and serve. Once the crust is completely cooled, spread cream cheese filling evenly over crust -- an icing spatula works wonderfully here to create a smooth finish. Arrange prepared fruit over the filling in any design you choose. Whether you overlap the fruit, completely cover the filling, or allow it to peek through is up to you. Once all the fruit is in place, use a pastry brush to gently apply the glaze to the fruit, or use a spoon to drizzle glaze over the tart, just be sure to cover the fruit. Don't be shy, the glaze is not just for looks, it also adds a pleasing citrus accent to the tart. Chill until ready to serve. Serve within 24-48 hours. Nutritional value does not include the fruit because each tart varies in amounts. If using coconut palm sugar in the crust, the mixture will be thicker, but can still be spread with a pastry knife to form a smooth crust. 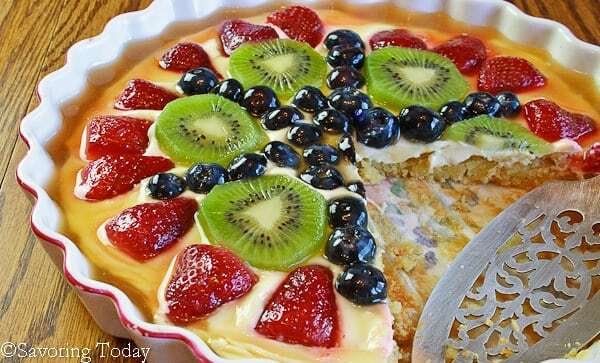 A simple Cream Cheese Fruit Tart with blueberries, strawberries, and kiwi. I totally agree with everyone…this is one beautiful tart. This tart is so pretty and full of fresh fruit and it’s one of my favorite desserts because it’s not to sweet. I love the almond crust too! So pretty and flavorful! I love the almond flour crust for a GF version. 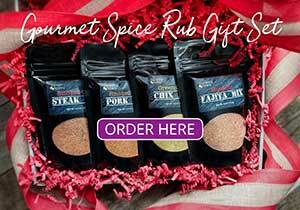 What a perfect treat for spring! I’m gonna have to track down all the ingredients and give it a try! This looks just wonderful! I love that the crust is grain free. What a beautiful tart. Love all the fresh fruit on top! This looks amazing! I love a good fruit tart and that crust sounds perfect. The whole buttery crust, tart fruit, and creamy filling was just TOO delicious! Couldn’t get it enough! 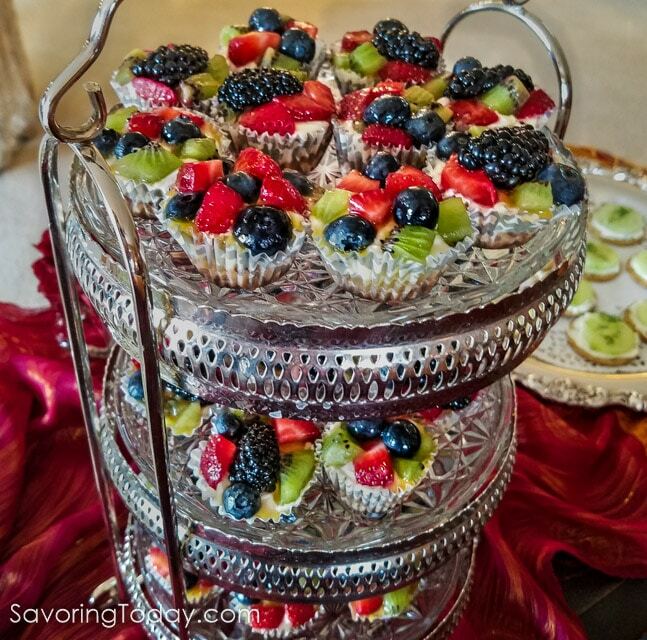 Fruit tarts are my favorite dessert! 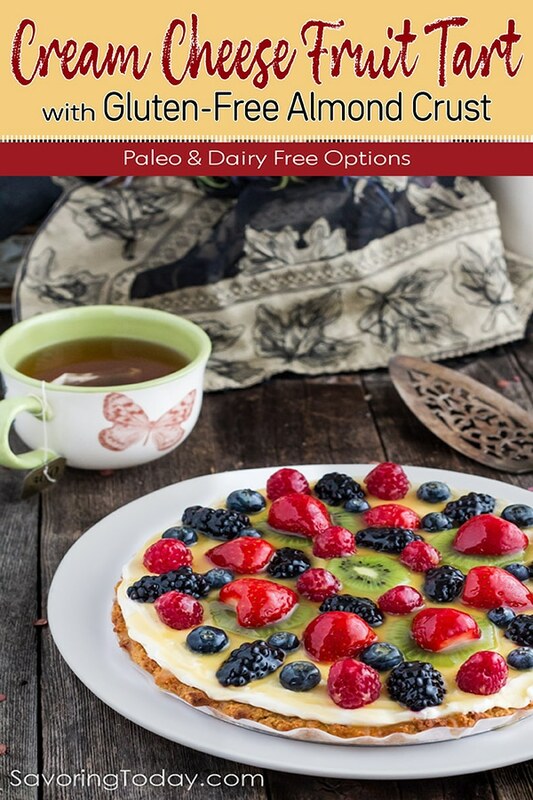 I’m a huge fruit lover and love that you have a gluten free version with almond flour! This looks absolutely delicious, love the sound of that almond crust too! Love serving this for brunch! How long would I bake crust if I use mini tart pans ? Oh Judy what a magnificent looking fruit tart. I will definitely be making this something later this season after things have warmed up just a little more. I was so excited when I came across this recipe. I made it for my family last night and we all loved it. The crust was a little tricky to spread as it was very sticky, but well worth it. I will be making this again this weekend for Father’s Day. Thanks so much for a great recipe. 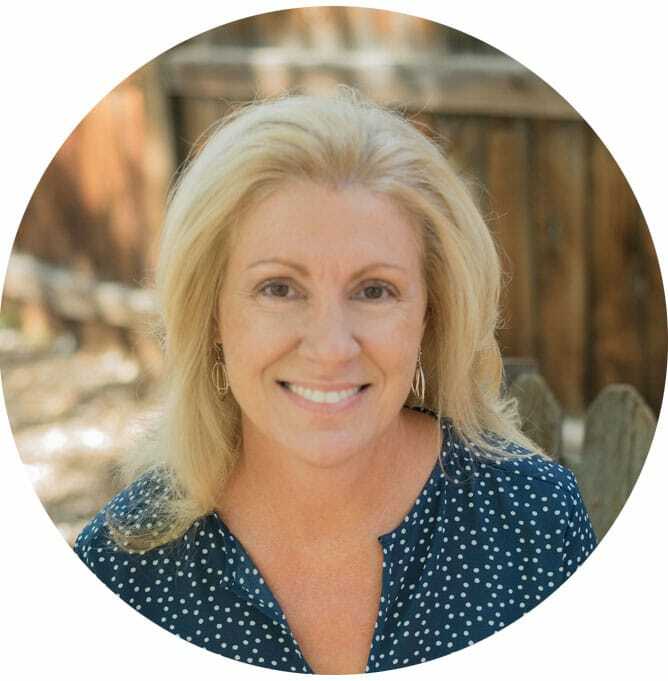 Aw, thanks Karen for taking time to comment and let me know you liked it — that feedback is so helpful as well as encouraging. 🙂 Hope your family has a great Father’s Day weekend. Yum! Looks perfect for the summer, and I love all this fruit medley. This would be perfect at my Easter Brunch. Judy, you really hit the nail on the head for me. As I have gotten a little older, I realize that it’s much better to be relaxed and create a menu that is pleasant but not overly ambitious. Hospitality is really a much friendlier way to think of “having people over” than entertaining. What a great post! This looks beautiful, I love the idea of almond flour and am very tempted by your ‘not too sweet’ description. Hi Mary, thanks for stopping by and saying hello — have a great week! Great looking tart! I love fruit tarts, both because of their eye appeal and their flavor is so awesome. And I absolutely am with you on the different between entertaining and hospitality. We used to do the former, and now practice only the latter. Great idea for a series. Thanks so much John, the idea that the eyes take the first bite is so true–the beautiful fruit makes is especially appealing. Glad to know you can relate with the upcoming series, it is dear to my heart. Really nice tart creation, love it. Nice colors too! 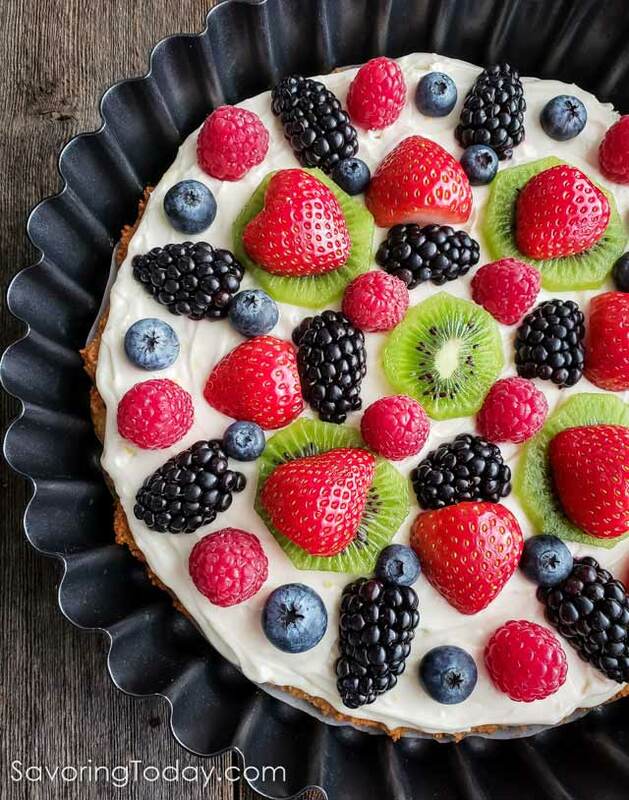 This fruit tart is a creation of beauty! Love the shining fruit! And yes, having too many people over too often can really get overwhelming. Thanks Julia, I appreciate your kind comment! You are right, having too many, too often, can get overwhelming rather quickly–I learned to set healthy boundaries after crashing a couple of times. Knowing when to say ‘Yes’ is key. Good to see you in the comments again — have a great Sunday! What a delicious looking tart! So colorful and yummy!!! Love the crust! Yes, I do know what you mean about hospitality vs. entertaining. We gave a dinner party last night and I had to keep reminding my husband, the perfectionist – “it’s o.k. if it’s not perfect. Let’s just have fun!” 🙂 Hope you’re having a great weekend! Your photo is wonderful. I’m sure your friends enjoyed sharing this delicious dessert with you…I know I would. Thank you, Karen, the photos have gotten easier with the help from the lighting kit. Now I just have to learn my camera better — ha! What a beautiful tart, Judy! You really made your friends feel special when you set this on the table before them. Now *that’s* being hospitable! I am in LOVE. I am I am just in love. I \have to try my hand at making this. Pretty and delish all at the same time. Thanks Maureen, we take the first bite with our eye, right? !